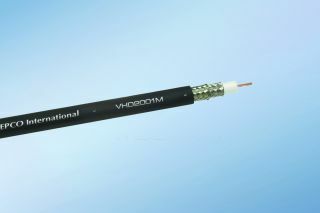 At InfoComm 2009, Gepco (Booth 5813) will showcase its VHD2001M, an extra-flexible RG6-type HD coax cable designed to meet the demands for high-definition video applications. Certified to a 4.5GHz bandwidth, VHD2001M is ideal for the transmission of uncompressed HD video in patching or remote applications. VHD2001M features a precision stranded 18AWG center conductor, a unique double-braided shield, and an extra-flexible matte PVC jacket for exceptional flexibility and flex-life. For the insulating dielectric, VHD2001M utilizes Gepco’s proprietary crush-resistant, gas-injected polyethylene compound that reduces attenuation and extends the operating bandwidth. As with all Gepco HD coax cables, all critical electrical and mechanical characteristics are manufactured to precision tolerances to ensure accurate signal and data transmission. Electrical specifications meet or exceed the SMPTE 292M and SMPTE 24M standards for HD coax, while the mechanical dimensions conform to industry-leading tolerances that ensure consistent stripping and connector termination.